An SUV crashed into a paving truck on southbound Lake Shore Drive just past Chicago Avenue. 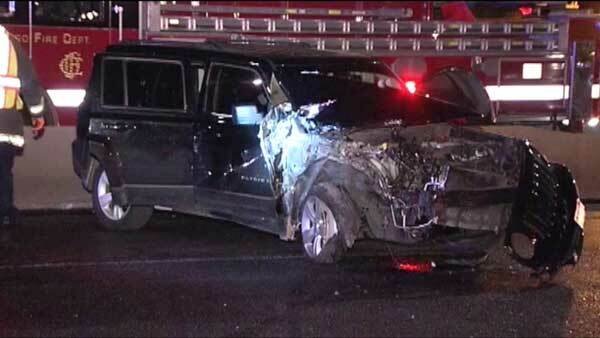 CHICAGO (WLS) -- An SUV crashed into a paving truck on southbound Lake Shore Drive just past Chicago Avenue. The SUV hit the truck around 2 a.m. Monday. No serious injuries were reported. Police issued the 26-year-old female driver two citations, one for failing to stay in her lane and one for not wearing her seat belt. The crash snarled traffic overnight as crews cleared the scene. The area was already more crowded than usual due to ongoing construction. Full-lane closures on Lake Shore Drive are scheduled to take effect for four consecutive nights this week, so that crews can resurface the Oak Street S-curve safely. All northbound lanes of Lake Shore Drive will be closed between East Randolph Street and North Michigan Avenue from 8:15 p.m. Monday to 5:45 a.m. Tuesday and from 8:15 p.m. Tuesday to 5:45 a.m. Wednesday. All southbound lanes of Lake Shore Drive will be closed between East Randolph Street and North Michigan Avenue from 8:15 p.m. Wednesday to 5:45 a.m. Thursday and from 8:15 p.m. Thursday to 5:45 a.m. Friday. The Chicago Department of Transportation said traffic will be detoured, but urges drivers to avoid Lake Shore Drive during this period. CDOT said the Dan Ryan and Kennedy expressways are good alternates.